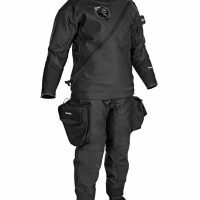 Our Demo Santi Ladies First E.motion Plus Drysuit offers the optimal and ultimate combination of the flexibility and lightness from E.Motion Ripstop quality and E.Lite durability and comfort with smart seals and Neck Tite System. Santi has combined both functionalities, a sophisticated cut and design to provide the highest performance while diving in many different underwater environments. The Santi Ladies First E.Motion PLUS will protect you where needed, keeping flexibility and light wear at the same time to give you a great hybrid suit that will last for years. The construction of Ladies First E.Motion PLUS utilizes flexible and light 235 g/m2 Ripstop trilaminate fabric for the upper torso and top front of the trousers. It then combines exclusive E.Lite trilaminated fabric of 535 g/m2 in the back of the trousers, belly, lower back area, elbows, crotch pad and lower part of the legs for maximum protection at places exposed to possible damage. An Elegant, exclusive color combination of black, grey and sliver with red highlights. Equipped standard with the innovative and comfortable SANTI Smart Seals® system. These soft rings allow fast and easy seal exchange for any seal including latex, silicone, bottle neck, conical, etc. Zipper is installed right shoulder to the left hip to allow for better exhaust valve placement. The Santi E.Motion Plus is equipped standard with SANTI Flexsole boots, Santi SmartSeals a 6mm or 9mm hood of your choice, STAY DRY travel bag, LP inflator hose, talc powder, and more. Colours: Black/Grey with optional Pink, Charcoal or Lime piping. Free DEMO Santi Flex 190 Underwear and Santi 9mm Hood with purchase of suit. These suits are in nearly “like new” condition with only less than 5 dives on each suit.